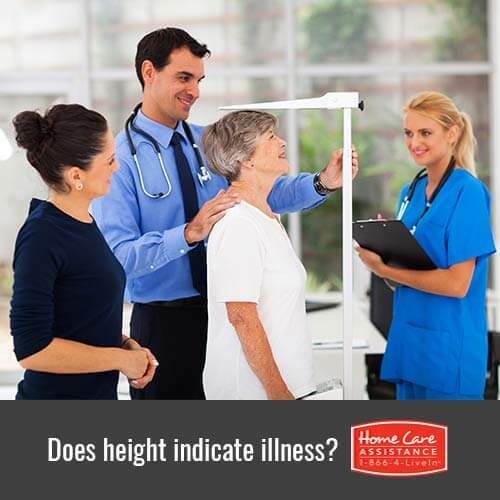 Can a Senior’s Height Determine the Risk of Disease? Medical researchers are constantly at work determining risk factors and causative links between our genes and the diseases we develop. On the surface, it is easy to pinpoint what diseases recur in a family, simply by evaluating familial history. But genetics are more complex than just our heredity. Scientists and Rhode Island caregivers now know that genetics can generate the most peculiar of correlations, such as the recently discovered link between height and pervasive diseases like cancer, diabetes, and heart disease. Swedish researchers have determined that taller individuals are significantly more at risk for developing cancers, specifically skin and breast cancer. These cancers are particularly prominent among taller women. Some scholars hypothesize that this correlation stems from the activity of growth hormones in the body. These particular growth hormones are required to create cancer cells, and since taller individuals have more skin cells than shorter people, the risk of these hormones activating cancer cells is greater. On the other hand, researchers found that those who are shorter than average are more prone to diabetes. This may be due to the fact that shorter individuals also have a higher likelihood of weight problems. Shorter people tend to struggle with weight because their nutritional needs differ from their taller counterparts, which makes it easy for them to gain excess weight, which can spur diabetes. In addition to a higher risk of diabetes, shorter people are also more likely to experience problems with cardiovascular disease. Some genes associated with short stature are also capable of triggering high levels of harmful cholesterol, which can result in heart attacks or strokes. Seniors who are below average height can still lower their risk of these serious conditions by avoiding tobacco products, remaining physically active, enjoying a rich and healthy diet, and sustaining a healthy weight. While it may be helpful to observe stature as a means of determining which seniors might be more at risk, professionals recommend that more emphasis be placed on maintaining healthy habits. Should your senior loved one require assistance maintaining a healthy lifestyle, turn to the professionals at Home Care Assistance of Rhode Island. Our highly trained caregivers promote wellbeing by helping seniors maintain a healthy lifestyle including healthy diet and regular exercise. To schedule a free consultation and learn more about Rhode Island home care, contact an experienced Care Manager at (401) 284-0979 today.